Can ya see the paw print can ya, can ya???? Its being blocked in the photo,why I don't know - what am I going to use it for, heck I don't know, I'm just pleased I can knit.......Ravelrys gonna be my best friend now I can tell ya, well once I work out how to increase,decrease and all the other stitches!! Anyone got any recommendations for needles? Keith did say before he went to work 'is that the end of the crochet now?' I'm shocked he could even ask such a stupid question LOL. ETA - Cathy & Rachael, no that cake in the last post wasn't Islas birthday cake,she had to make do with a good old fashioned hedgehog one courtesy of nanny LOL. Well done on the knitting I am impressed, the last time I tried to knit (only about 20 years ago) I made a scarf which had lots of ventilation holes!! wow sarah this is awesome, i dont know how to do that yet, but you tube is my best friend as is ravelry, im on there under reward funnily enough. 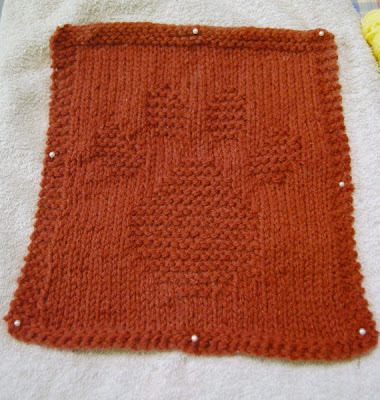 Brilliant work with the square knitting hun - and to add a paw print WOW! you should be very proud! Yay on the knitting! I love Ravelry too and You Tube has taught me to knit haha. What's your name on Ravelry, mines EmmaWoo.